Yesterday I performed shakuhachi (plus bass and vocals) with a 50 piece Gospel choir and 7 piece Gospel band at a very well attended outdoor concert in Hobart. Praise the Lord! How on earth did anyone hear the shakuhachi over a gospel choir? The incredible power of my blowing technique.................................that and a microphone. No-one blows as hard (and loud) as Tairaku ! ! ! Well, it wasn't me blowing! I can't blow that hard! So basically you guys are calling me a BLOWHARD! Wasn't your flute once refered to as a cannon? I'm sure the microphone helped with the choir, but there aren't a whole lot of flute players getting that much sound out. Chikuzen said, "I will try to teach this song if I can hear myself over this cannon in front of me." All joking aside it is difficult to get a lot of sound directed at a microphone without having the sound cut out due to reflection of the wind off the mic. People think you just stand in front of a mic and blow but it's not that simple. 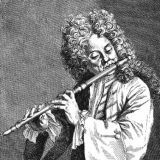 Regarding blowing technique, I prefer to think of it as "focused" or "concentrated" blowing than just "blowing hard" because you can blow as hard as you want and if most of the air remains outside the bore you'll still sound weak. Absolutely! And this is an extension of the art that comes with a great deal of trial and error and few manage to master as Brian so aptly has. That is absolutely right, Brian. And you do surely have a powerful sound! I really loved the contrast of sounds and playing techniques in the concert we shared together (organised by Ken LaCosse) in San Francisco a few years back. I may not play in as quiet and esoteric way as Okuda, but I surely have some aspect of his sound in my playing. With that and your blowing technique, one could say, that concert showed two contrasting ways of jinashi playing. That's not so bad, Tairaku. Most people tell me that I just blow.